I’ll start right off by apologizing for the misleading title. The drink didn’t turn out Ruby colored, or even a pale pink. You get a nice eggshell color when the foam subsides. Oh, but it’s delicious so let’s just put that name game past us. Around New Year’s I started hearing about a drink called a Diamond Fizz. Ooh fancy pants, I thought. After digging into the recipe, the only marked feature is that you replace the soda water in a Ramos Gin Fizz with Champagne. I still had a couple bottles of Gloria Ferrer Blanc de Noirs at home and didn’t feel the need to go buy more sparkling anything. In my head I imagined the rosiness of the wine to come through and create a two-toned drink to which I would name it the Ruby Fizz. Not so fancy as a diamond, but still pretty classy. Alas the color didn’t turn out right, but still keeping the essence of the base (or topper in some Fizz cases), I decided on sticking with that name. Before you read on let me just mention one thing. There is an egg white in here. NO! Don’t be scared! If you go out for cocktails you might see an egg white turn up on the occasional menu. This is a good thing, I’ll explain. 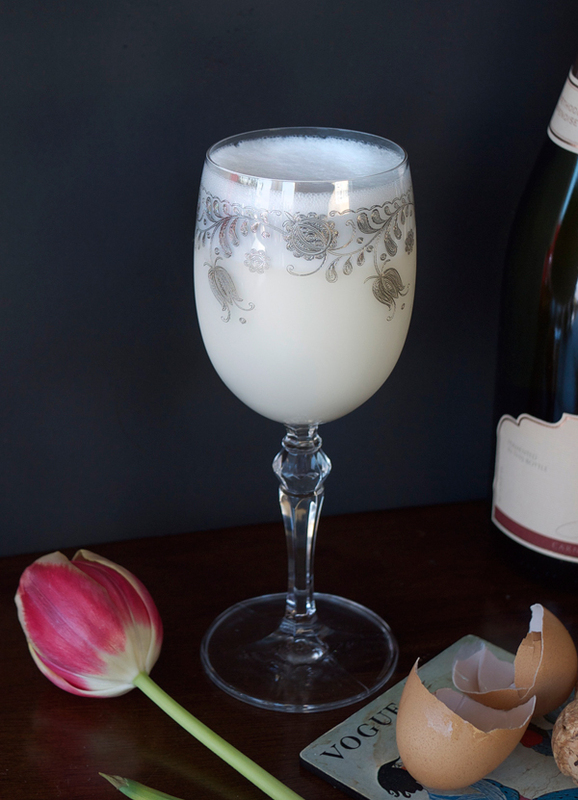 Reading about egg whites in cocktails, I kept coming across the notion that they only add a silky texture to the drink- no egg taste. However, it wasn’t until I made this drink that I realized that yes, it really is silky. The cocktail transforms into something airy, like a cloud in your mouth if you will. Is there a chance you can contract Salmonella? There could always be a teenie tiny chance. You can avoid this by using dehydrated egg whites or getting very fresh eggs, super pasteurized eggs, or liquid egg whites. Your choice. I still lick the spoon after baking every time and I have yet in my life so far gotten sick from doing it. Let’s continue with the drink making! 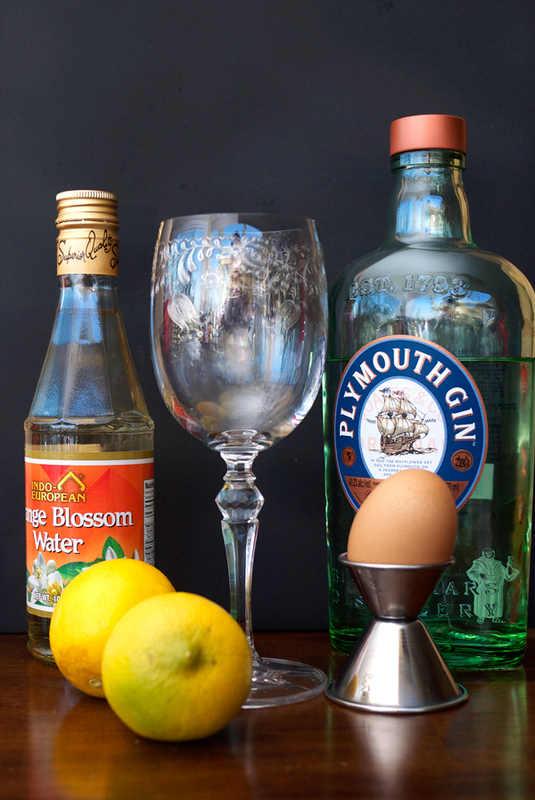 Combine all ingredients except the Blanc de Noirs in a Boston Shaker and dry shake (no ice yet!) until frothy. Add ice and shake vigorously for about TWO minutes. Yes, seriously, that long. You got someone around wanting to show off some muscles? Have them do it. You want to show off your muscles? Make this drink. 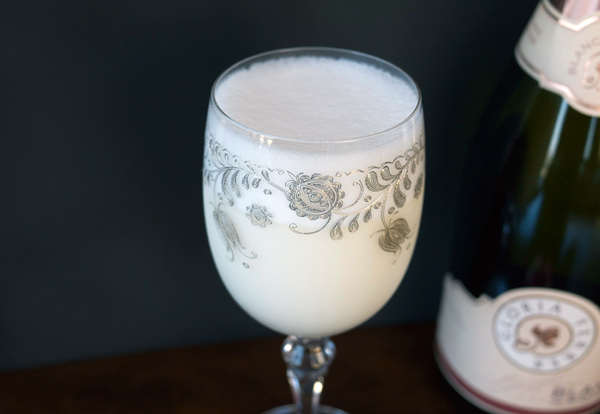 Add the Blanc de Noirs to the bottom of a chilled wine glass, or a Collins glass (some recipes call for adding it in last but that killed my foam when I tried it). Fine strain the rest of the drink on top. My first whiff of the drink is a lot of the berry from the Blanc de Noirs, then subtle floral notes from the orange flower water. Those floral notes open up into a fuller flavor after you pass the smooth layer of aromatic foam. For a drink with cream in it, it’s not heavy at all. There is a tiny bite from the citrus and the fruity gin in the finish. This cocktail is so light and refreshing you could drink it at breakfast, but I could also see it in place of fruitier white wines to have with fish or light appetizers. One note on the orange flower water: be careful with the drops. I found that two were plenty for adding that floral note to the drink, but more and it tastes like perfume. Gross. I cobbled this together from several sources to get a solid base for the drink, but I disagree with those wanting to add more than 3 drops of the orange flower water. Also, don’t skip the dry shaking as it really helps start the foam. If you find that you can’t shake the shaker for the required time, I’ve read of a couple places that use a blender or an immersion blender to help blend the egg white and cream. I just unearthed a frothing device (it looks like this ) and I imagine this could also help in place of an immersion blender. I will have to try on the next recipe. Last Wednesday was officially my two year anniversary here on this blog. I would have written something had I not been preoccupied with doctors and the like for the past week. But here I am now! Scanning my latest booze purchases as I unpack and place them with my current stock, I can’t help but notice how my liquors have changed. I’m still buying the same bases: gin, whiskey, rum, etc… but when I look over the brands, it’s what I don’t see anymore that amuses me. I remember when the only whiskey I had on hand was Jack Daniels. And there was a bottle of Jose Cuervo too, and not much else. Now we’ve had to expand where the liquor goes, taking up a large section of a credenza (until that bar gets built!). I see a lot of small batch products, a lot of products that you couldn’t get in the U.S. five years ago (thank you cocktail movement), and around 12 bottles of bitters I’m still trying to get around to opening. It’s been a lot of fun writing and explaining to my husband about my need to budget in alcohol into every month. Many of the first resurgence of cocktail blogs seem to be cutting back, falling off, writing elsewhere, but I’m discovering a whole new group of cocktail enthusiasts to which this is all a new love. And I’m exciting to be adding a few new drinks in there too. I was really freaked out of egg whites in drinks too until I had my first one 🙂 Although I don’t really like creamy cocktails, do you think this would work without the cream? maybe would be more pink too! 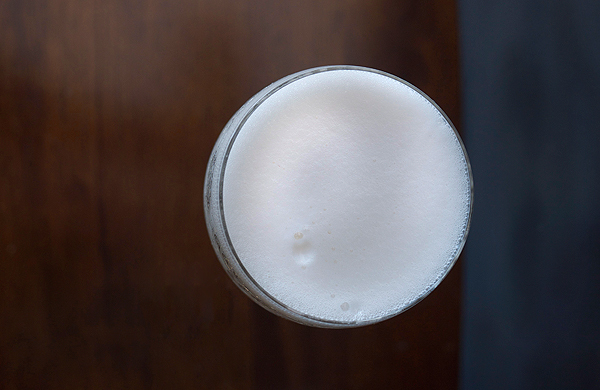 People who like the original Ramos Gin Fizz are FANATICAL about the ingredients that go in it. I think that if you took the cream out you’d end up with a totally different drink. I’d probably take out the egg too in that case. Who knows, it might just make a refreshing sparkling drink instead! Holy moly, that is a beautiful glass! Someone on instragram was talking about getting good stemware @ estate sales. I may have to give that a try. Personally, I LOVE me some egg white in a drink and an angel loses its wings somewhere when I get a whiskey sour w/o any in it. Hope you feel better. Hey Raul, thanks! I believe this glass came from Anthropologie. I’ve tried finding glasses at second hand stores, but no luck really yet. What IS a great place is Etsy! This drink sounds awesome! 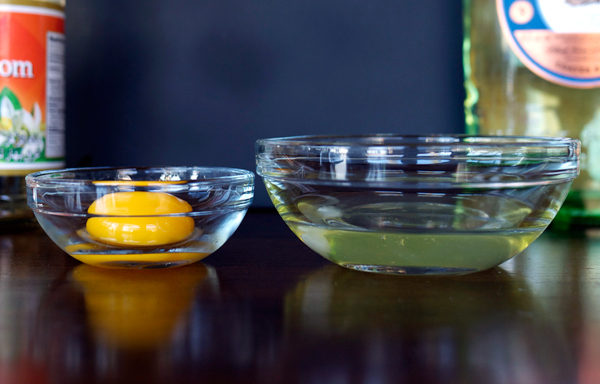 I will try my hardest to not be afraid of the occasional raw egg white found in drinks and try to remember that, just like when making a french meringue, egg whites help create magnificent silkiness. Thanks so much for stopping by the site!! That looks really good. We have a new gin distillery in the area. I’m going to pass this link on to them. Thanks for sharing.